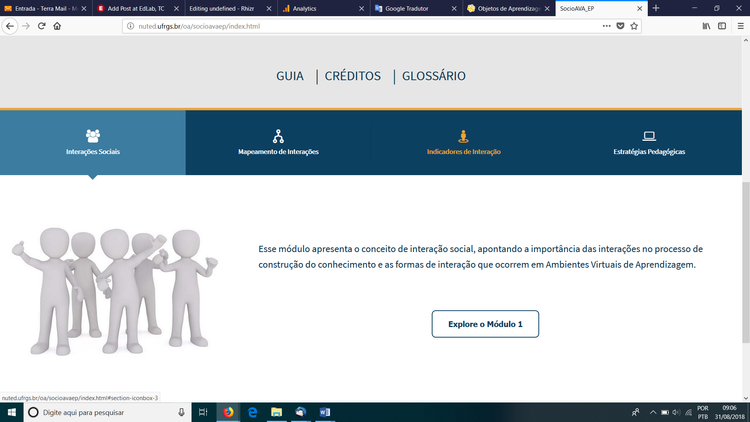 This post is about the development and implementation of the SocioAVA digital educational material named Social Interactions in Virtual Learning Environments. The material is aimed at professionals working in Distance Education (DE) who are interested in discussing social interactions in the virtual. The objective is to discuss social interactions as an important factor to be included in pedagogical practices developed in Virtual Learning Environments (VLE). It consists of four modules, bringing cases that can contextualize, discuss and exemplify social interactions in pedagogical practices in DE. In each module are explanatory texts and support materials such as videos, presentations, animations, audios, hypertexts, infographics, among others. To help in the discussion about the content in question, activities are also proposed in the form of challenges in order to problematize the topics addressed. For the development of SocioAVA digital educational material, an interdisciplinary team composed of educators, programmers, musicians and web designers was involved. The methodology adopted was ConstruMED in which it is focused on the construction of Digital Educational Materials (DEM) based on pedagogical design. This methodology is composed of five stages: Preparation, Planning, Implementation, Evaluation and Distribution. The application of DEM will occur in undergraduate and postgraduate courses in the area of Education. It is intended to test the operation of the material, its degree of adequacy to the target audience and level of achievement of the objectives, verifying the operation and to analyze if the DEM was in agreement with the technical, functional and didactic characteristics that are included in the project. It is understood that in DE is extremely important the appreciation of the student's role in learning, since at various moments is physically distant from the teacher and colleagues. In this way, the constant interaction between the actors of the VLE is fundamental for the pedagogical success in this modality.